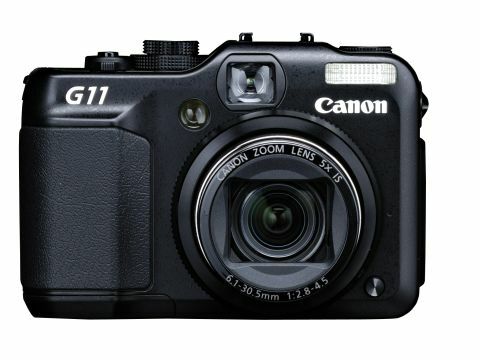 The Canon PowerShot G11 is Canon's flagship compact, and the latest model in the popular and well-regarded 'G' range. Its predecessor, the 14 megapixel Canon G10, managed to appeal to compact camera owners seeking maximum imaging power and flexibility, as well as SLR users looking for a smaller back-up camera. So the Canon G11 has its work cut out. Which makes it even more surprising to hear that the G11 actually has a lower resolution sensor than its predecessor, offering a 'mere' 10 megapixels. This seems a bit risky from a marketing point of view - like it or not, megapixel count still has the power to sway the wavering punter - but Canon believes the numerous other improvements to the PowerShot G11, such as improved image processing technology, higher ISO sensitivity and all-new swivelling LCD, can compensate for the loss of pixels. The PowerShot G11 has a faster flash synch speed too (1/2000th sec) and an HDMI output to enable you to view your stills and video on a HD TV, for example. The Canon G11 can shoot in RAW, as with its predecessor, and is compatible with Canon's Digital Photo Professional software, suggesting Canon is very much aiming the PowerShot G11 at serious amateurs and pros seeking a more portable, more discrete alternative to a full-blown SLR. Rivals include the Panasonic Lumix LX3 and Nikon CoolPix 6000; at a smidgeon under £500, the PowerShot G11 is also competing against budget D-SLRs, such as Canon EOS 1000D and the Nikon D3000. So the PowerShot G11 is clearly not a cheap backup option, or impulse purchase, and needs to prove its ability to transcend the usual limitations of a compact camera compared to a budget SLRs - namely smaller, noisier sensors, less sophisticated image processing, reduced creative controls and, of course, a much narrower choice of lenses. The G11 is equipped with the same image stabilised lens as the G10 (equivalent to 28-140mm equivalent), with a versatile 6x optical zoom. This lens is a great wide-angle performer, and your shooting flexibility is greatly enhanced by the new swivelling LCD. But what Canon gives with one hand, it takes away with the other, as the LCD is actually smaller than on the PowerShot G10. The G11 is also compatible with a wide range of Canon flashguns and underwater equipment, though as mentioned, you have nowhere near the lens flexibility you get with a comparably priced budget SLR. Enough overview, what the PowerShotG11 like to use?